NIGERIAN MUSLIM BEER BASH………240 000 BOTTLES SERVED – The Tundra Tabloids……. 199, 999 bottles of beer on the ground, 199, 999 bottles of beer, take one more down and pass it around……. 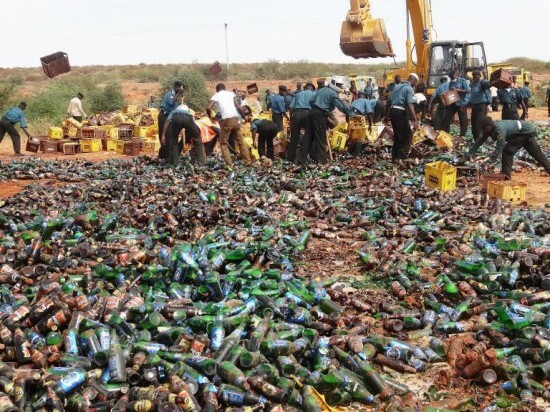 KANO, NIGERIA – Islamic police shouted “God is great” as an earthmover shattered 240,000 bottles of beer in a widening crackdown in Nigeria’s northern city of Kano. Alcohol is banned under Shariah law imposed here in 2001 but authorities had turned a blind eye to its consumption in hotels and the Sabon Gari Christian quarter. At the public destruction of beer Wednesday the head of the religious police board warned his officers will put an end to alcohol consumption. Bars in Sabon Gari were the target of multiple bombings July 29 that killed 24 people, carried out by suspected Islamic militants who have charged authorities are not properly applying the Shariah law that governs nine of Nigeria’s 37 states. The oil-rich country is divided between a mainly Christian south and predominantly Muslim north. Previous Post Previous Post RELATIVES OF MURDERED BRITISH SOLDIER FLEE MURDER TRIAL DURING VIEW OF VIDEO FOOTAGE OF LEE RIGBY’S ASSAULT……..
Next Post Next Post VIDEO OF HAMAS TUNNEL DIGGERS AT WORK IN GAZA, ‘JOURNALIST’ SAYS HAMAS TELLING FATAH TO PREPARE FOR WAR……….